San Francisco is a colourful, creative city, revelling in freedom and openness. Often eccentric, always charming, this vibrant destination has much to offer, from its eclectic neighbourhoods and stunning surroundings to its wonderful seafood and architecture. 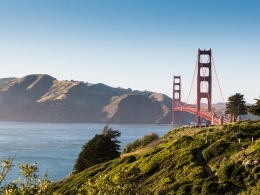 San Francisco is characteristic of the cool, dry summer and mild, wet winters. Temperatures exceed 75 °F (24 °C) on average only 28 days a year. Whatever time of the year you visit San Francisco; it is always wise to carry a jacket or sweater with you! The minimum driving age is 16 years but most rental companies require that you be at least 25 years old, have an international driving license, a second form of identity and a major credit card. Legal age for drinking in the US is 21 and many places will ask for identification. All EC San Francisco students must be covered by health insurance for the entire length of their stay in the U.S.